Ehden’s history dates back into the BCE period. Its indigenous people transformed rocky hills into land suitable for crops, irrigated by water from mountain streams. The people of Ehden have contributed to the fields of thought, literature, patriotism, and religion in Lebanon. Ehden was the original homeland for Zghartians who later established Zgharta on the Lebanese coast in the 16th century. It was/is a warmer winter season home below the mountains' snow. Four centuries later it has become primarily a summer resort. Some early texts mention that the people of Ehden are descendants of the tribe of Shem, the son of Noah. - 700 BCE: Sennacherib, the Assyrian king through his leading assistant Rabshakeh, occupied Ehden and destroyed it by setting it alight and overturning its statue. - 300 BCE: Seleucus I, leader of an army that was a part of Alexander the Great's Macedonian army, rebuilt Ehden. Seleucus I also built a large pagan temple on the eastern side where he erected a statue of the Sun-god Helios. - 64 BCE: Pompey blockaded Ehden. He conquered and destroyed it. It was not until the rise of Christianity that the Lebanese rebuilt it. At the end of the 6th century Ehdenians converted to Christianity. Maronite priests of Saint Maroun and St. Simeon Stylites helped convert them into Maronites. They built five churches all at once on top of the ruined idolatrous temple, using its stones for building Mar Mama, Mar Boutros, Mar Youhana, Mar Ghaleb and Mar Istfan. In addition, they raised huge stone crosses on top of the mountain. A brief account of Ehden's history has been found written by one of its inhabitants who fled from the Mamluk invasion in 1283, tying the manuscript to his chest for safekeeping. Ehden used to be a significant site for idolatrous beliefs where numerous temples and enormous statues were located such as “Baal Loubnan”, “God of Snow” and “God of the Sun”. Due to major destruction that engulfed Ehden throughout its history, most of those statues and temples were destroyed. Huge rocks that have remained scattered on mountaintops, as well as large stones used in building some of its churches, still leave indication of that era. Father La Monse the Jesuit stated that there are three scriptures in Mar Mama church, two are written in Greek and another in Syriac. There is also a historical writing, which was transferred to France and is preserved in its Paris museum in the Orient section, numbered 4524 and dated 272 AD. Dr. Philip Hitti in his book Lebanon in History affirms that “Ruins dating back to the era of the Roman Empire are widely spread over the mountains. Statues carved on rocks, in addition to Greek and Roman sculptures, graves, temple ruins and buried columns were found in branched and distant villages like Chouslan, Kartaba, Akoura, Tanourin and Ehden.” Ehden’s most famous Christian site is “Dayr al-Salib” (Convent of the Cross), which is a symbol of an era of transformation for Ehdenians who had turned away from idolatry and converted to Christianity, according to a historical document written by Father Kozma. 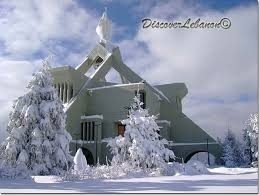 This convent is situated between Ehden and Bkoufa in the versant of Mar Sarkis’ mountain. It is a large grotto containing an altar and was identified by large stones forming a cross that was placed on top of its entrance, but vanished in 1935. Nevertheless, Al-Semaani wrote in his book The Eastern Library that he witnessed those cross-engraved stones in Hassroun, Bsharri, Ehden and Aytou. Mar Mama church, which was built in 748, is considered as one of the oldest Maronite churches in Lebanon. Father La Monse described it as “an eighth-century church built over a destroyed Byzantine church (sixth century) which was in turn built over an old Canaanite temple.” Mar Youhana church was built in 779 but was ruined. Some of its huge stones were still around until the start of the 20th century. Two churches belonging to Mar Sarkis convent were built, the first in the 8th century and the other in the 12th. Names of some areas hold a historical meaning such as “Al-Baoul area” named after (Baal the God), “Bab al-Bowayb” meaning (The Door of Doors) for it leads to the kingdom of “Afka” in Ehden’s forest. 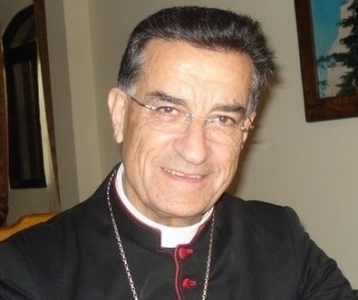 Afka is the first holy city in history according to Father Dr. Youssef Yammine al-Ehdeni who is trying to prove this theory by embarking on historical research he has not as yet completed. Nowadays the people reside in their Ehden homes during the summer months for cooler days and in their Zgharta homes for warmer winters. A popular saying based on this moving between homes is “We cross ourselves and then move down and we celebrate and then move up.” This annual migration coincides with the Raising of the Cross Day, 15 September, and around Easter time. Ehden is a beautiful city renowned for its healthy environment, moderate dry climate and natural fresh water. It is one of the main summer locations of Lebanon. 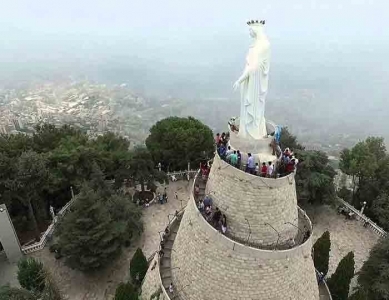 Visitors reach Ehden travelling from Beirut through Tripoli, Zgharta, Arjes then Ehden, or from Beirut through Seika, Al-Koura, Seraal, then Ehden, or from Beirut through Baalbak, Al-Arz-Becharri, Kfersghab, then Ehden. There are lots of famous quality restaurants in Ehden known all over Lebanon for their hospitality, high standard, pleasant food and generosity. Most restaurants are located near Mar Sarkis water stream, Al-Dawalib, Horsh Ehden and Al-Middan. 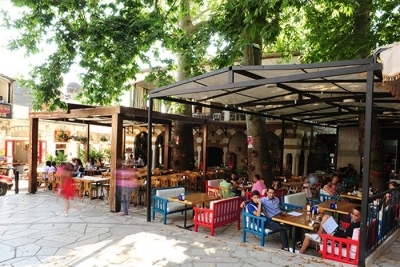 Al-Middan is well known for its cafes, sweet shops and entertainment. Annual Folkloric Festivals are held on Al-Middan. 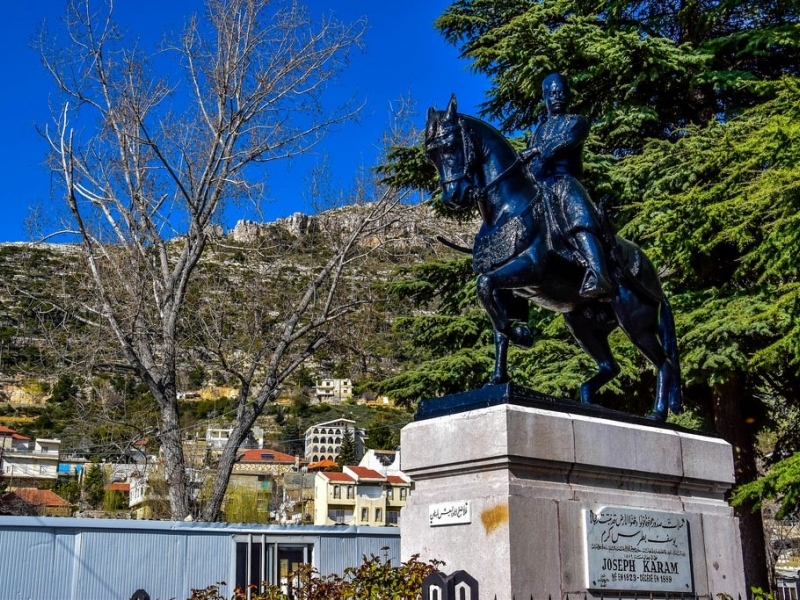 Many tourists and visitors who attend Al-Middan ultimately visit Mar Gerges Cathedral, the coffin of Youssef Bey Karam and his statue on “Al-Ketla”, and the statue of Al-Sahyouni and Sheikh Asaad Boulos Gravesite. Many cafes can be found in “Al-Moghtaribin” (Immigrants) Street and “Al-Mattal” area, creating an atmosphere of celebration lasting all over Ehden summer attracting tourists and visitors from Lebanon and the world. Concerts featuring stars of Lebanese and Arab singing are held almost nightly. First class hotels and resorts are available for tourists. 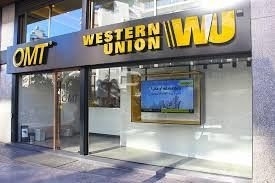 In addition to modern motels, bars and clubs. Ehden has experienced a building boom in recent times extending beyond its traditional precincts where modern villas and apartments were built. New roads have been developed and old ones were widened to cope with increasing traffic. Convenience and tourism services for comfortable living are widely available in Ehden. There are various shopping centres, speciality shops, health services provided in a public hospital operating throughout the year, plus medical surgeries, chemists, official centres, post and phone centre, summer schools. Ehden is a site for art events such as hosting cultural and art galleries, stage theatre, open air plays, lectures and forums held by Zghartians and Lebanese thinkers and intellectuals. The name of Ehden comes from Adon, Adonis meaning "power, stability and tranquillity". It is corroborated by the Arabic root Hdn meaning "steadiness, calm and fertility". Adon means also "the base and the mountaintop" translating into "top of the mountain and its base". Patriarch Estephan El Douaihy, along with Father Martens the Jesuit, lean toward the conclusion that Ehden’s name is derived from Eden where Adam and Eve lived following their exit from paradise. Douaihy left a booklet in Latin regarding his point of view. 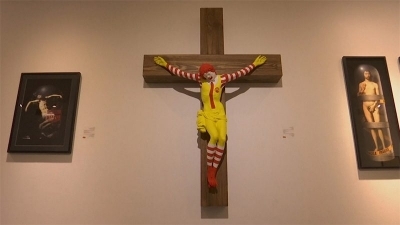 It is kept in the Vatican library. Orientalists Hawiet, Rose Goaler and Orkwart supported Douaihy and Martens’ viewpoint. It was contested by Ernest Renan in his book Mission en Phenicie and by Father Henri Lammens. Ehden is located in the central northern side of Mount Lebanon, with a 1500-metre (at Midan square) elevation from sea level. It is 120 kilometres (75 mi) from Beirut, 30 kilometres (19 mi) from Tripoli and 25 kilometres (16 mi) from Zgharta. Ehden used to be the sole residence for Zghartians prior to the establishment of Zgharta. It is known for its dry climate, water and forest. It is a renowned summer location, famous for its setting on the Mar Sarkis (Saint Sarkis) Mountain overlooking coastal towns and villages as far as Akkar to Shikka. A large number of local and overseas tourists visit Ehden annually. The mountain town is located 1,500 metres (4,900 ft) above sea level, and is 30.8 kilometres (19.1 mi) from Zgharta, 110 kilometres (68 mi) from Beirut (the country’s capital) and 39 kilometres (24 mi) from Tripoli, Lebanon. Ehden is a famous summer resort and touristic center, often called "The Bride of Summer Resorts in the North of Lebanon." Gastronomy is one of the most prominent tourist attractions in Ehden, especially in summer. Kebbeh Meshwyeh (krass) and the Kebbeh Nayeh, both traditional cuisines, and particularly notable in this town.